The sixth edition of this popular pilot by Rod and Lu Heikell contains substantial changes to the content and is available now. A comprehensive companion to the long coastline which ranges from Spain and the edge of the Pyrenees to the Alpes Maritimes and Italy, it covers the flat country of Languedoc-Roussillon, the coast of the Golfe du Lion, the Rhône delta and the Camargue, the industrial Golfe de Fos, the Côte d’Azur and the French Riviera and Monaco. The island of Corsica and the waterways that run behind the coast linking the Canal du Midi and the étangs to the Rhône are covered in separate chapters. 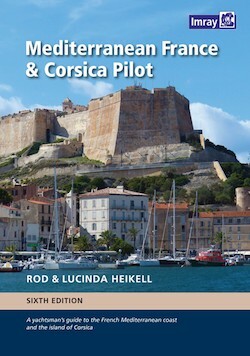 The authors spent the summer and autumn of 2016 cruising in Corsica and then across to the Golfe du Fos where they left Skylax for the winter. During their travels they visited a large number of harbours and anchorages, collecting the latest information and taking new photographs. There are new aerial photos for many places and in particular for ports and harbours in Languedoc – Roussillon.